Nestled deep in the Pennsylvania Wilds are 29 state parks. These parks are home to the unequalled natural beauty of vast primeval mountain forests of hemlock, pine and oak, not to mention breathtaking mountain top views that visitors and residents alike are known to love and enjoy. With more than two million acres of public land, the Pennsylvania Wilds is a true sightseer’s delight; its state parks are hailed as such by countless publications and online news sites. And as we enter fall, these views take on a whole new aesthetic. Among the Pennsylvania Wilds state parks noted for their sightseeing opportunities, several consistently appear to stand out. 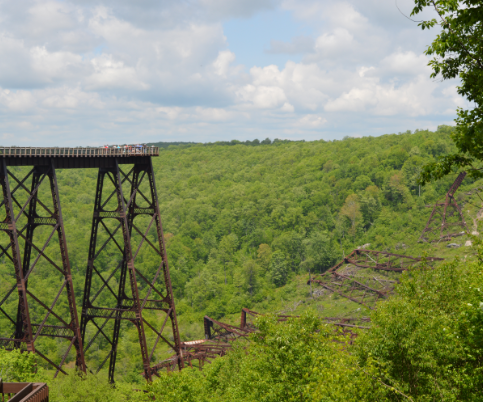 Constructed as an alternative to laying an additional eight miles of railroad track over rough terrain along the line leading to McKean County’s coal, timber, and oil lands, the Kinzua Bridge viaduct spanning the vast Kinzua Valley, began during 1881. Completed in 1882, the Bridge viaduct was the longest and tallest railroad structure at more than 2,000 feet long and 301 feet high. Fast-forward 121 years and one tornado later. The Kinzua Bridge was partially destroyed by a twister in 2003. Some of the support towers remained intact while other towers tumbled down like dominoes across the valley, where they remain today. The great railroad bridge spanning the valley was no more. Reinvented as a pedestrian walkway several years later, Kinzua Bridge State Park visitors today “walk the tracks across the sky,” 600 feet out on to the remaining support towers, gaze miles out into the Kinzua Gorge and peer down at the spacious valley below through a partial glass platform at the end of the walkway. A favorite among tourists and sight-seers alike, the 339-acre site in the Allegheny National Forest & Surrounds Landscape is rapidly becoming one of the most visited of all the commonwealth’s State Parks. Complete with a series of hiking trails and overlooks, the Kinzua Bridge Visitor Center and Park Office features interactive exhibits and historical films shown in a mini-movie theater, as well as the recently-expanded PA Wilds Conservation Shop, which offers unique keepsakes and gifts made by hand by creative makers in the Pennsylvania Wilds. Small but beautiful, Hyner View State Park is big on natural beauty, featuring one of the most breathtaking overlooks of all of our state parks and a popular spot for hang gliding! The focal point of Hyner View is the overlook wall, constructed during the 1930s by the Civilian Conservation Corps (CCC). A memorial to fire wardens and a bronze statue to the CCC boys are featured near the overlook, located conveniently along the Bucktail Scenic Byway in Elk Country. During 1949, the present park access road was built, providing better access to the view. With the opening of this road, the Flaming Foliage Festival — an event now in its 70th year that welcomes the colors of fall and includes vendors, a Queen’s contest and more — was first held at the view. This festival has since outgrown the view and has been moved to the nearby borough of Renovo (and is this year slated to take place October 12-14, 2018). 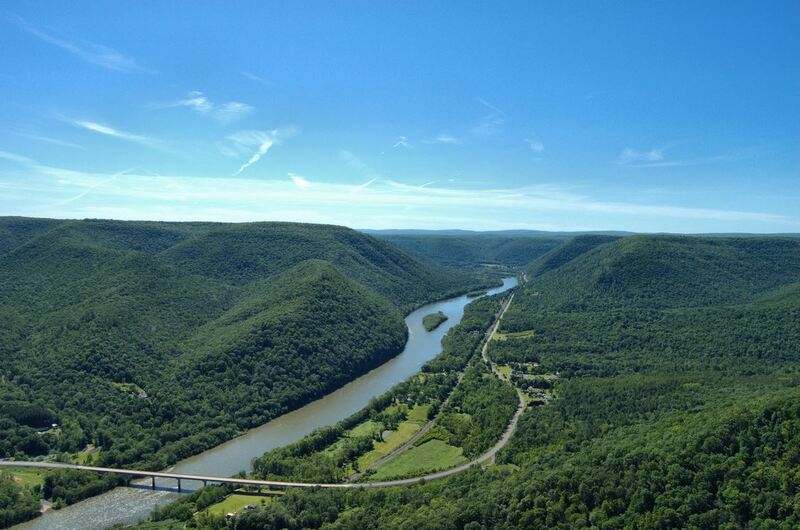 From the scenic vista, you can take in the vast panorama of the West Branch Susquehanna River down below. In autumn, Hyner View and nearby Hyner Run State Park are a tourist’s delight with miles and miles of hiking trails and scenic highways. Hyner Run was also developed by the CCC. Although most traces of the camp are gone, some remain as reminders of that era. As thousands of vacationers will attest, Cook Forest State Park provides the perfect back-to-nature experience with 8,500-acres. Known for its stands of old growth forest, the park’s Forest Cathedral of white pines and hemlocks is a National Natural Landmark. Ambitious hikers can hike the Seneca Trail — and those wishing to get there a little easier can find the access road — to view the Seneca Point Overlook, which offers views of the Clarion River Valley. Nearby, visitors can find the Historic Fire Tower #9, which offers an 80-foot ascent and provides unique views of the area. When the weather is clear, one can see up to 20 miles away. A scenic 13-mile stretch of the Clarion River flows through the Cook Forest & the Ancients Landscape and is extremely popular for canoeing, kayaking and tubing. Nearly 50 miles of hiking trails meander through the vast forest and banks of the Clarion River, and bicyclists enjoy more than 12 miles of bike trails. John Cook, the Park’s namesake, was the first permanent American settler to the area. He arrived in 1826 to determine the feasibility of building an east to west canal along the Clarion River for the Commonwealth. John purchased 765 acres and settled here with his wife and 10 children in 1828. Today, several large homes on River Road are still maintained by the Cook Family and descendants. These two separate state parks are perched on opposite sides of the Pennsylvania Grand Canyon’s Pine Creek Gorge, which runs 50 miles long and, at certain points, reaches depths of 1450 feet. 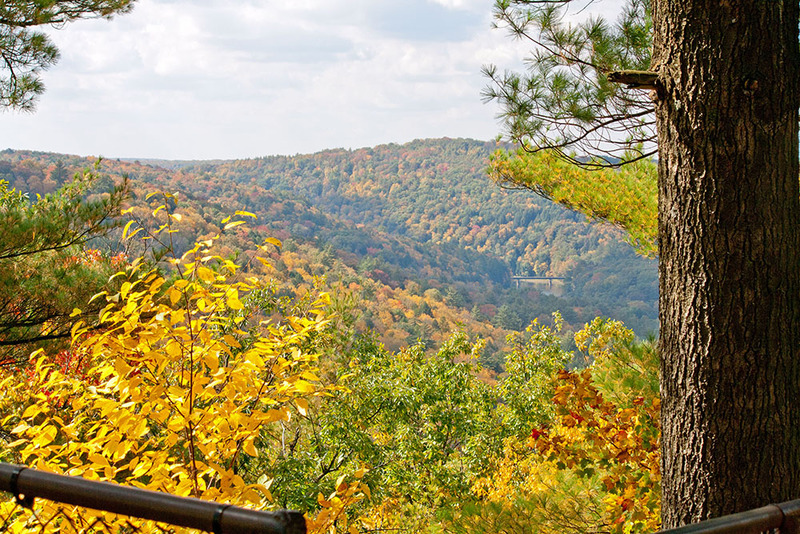 On the east rim of the canyon is the 585-acre Leonard Harrison State Park with modern facilities, a visitor center and the most famous scenic views of the canyon. The Turkey Path Trail (listed as “most difficult hiking” by DCNR) winds its way into the bottom of the canyon. On the way down, hikers are treated to beautiful views of the canyon walls and some hidden waterfalls. Over on the west rim of the canyon lies the more primitive, 368-acre Colton Point State Park. 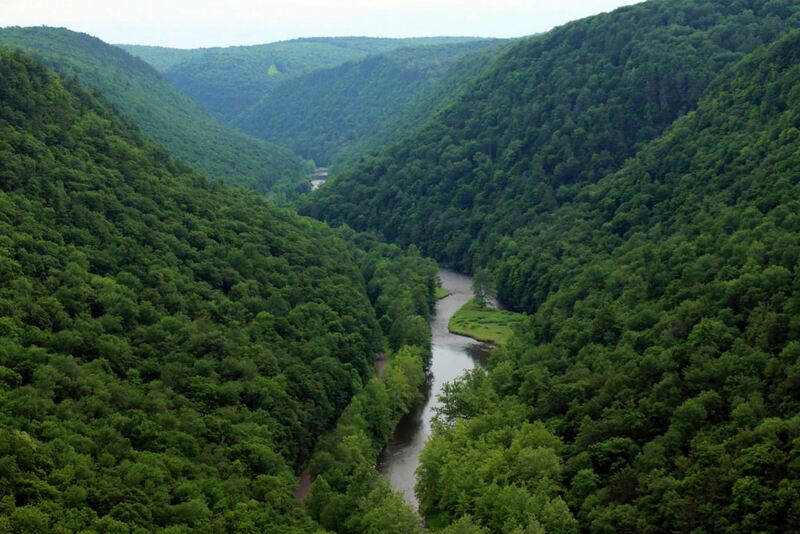 Its rugged overlooks offer great views of the Pine Creek Valley & PA Grand Canyon Landscape. Colton Point was developed by the Civilian Conservation Corps and opened to the public in 1936. The CCC’s contributions are still visible today through the five stone and timber pavilions in the park. In 1988, the CCC-built facilities were added to the National Register of Historic Places. Black Moshannon State Park was the site of one of America’s earliest conservation projects, and guests can still visit the various national historic sites and cabin towns that were part of the national building projects of the 1930s. If a diverse landscape is your thing, you’re in luck. With nearly 20 miles of trails passing through many varied natural habitats, Black Moshannon State Park covers nearly 3,400 acres of forests and wetlands in a unique environment. Surrounding the park are more than 43,000 acres of the Moshannon State Forest, creating a wilderness setting that provides recreational opportunities in all four seasons. According to local legends, American Indians called this watershed “Moss-Hanne,” meaning “moose stream,” thus the origin of the park’s name. Appropriately, the “black” in the park name describes the tea-colored waters. 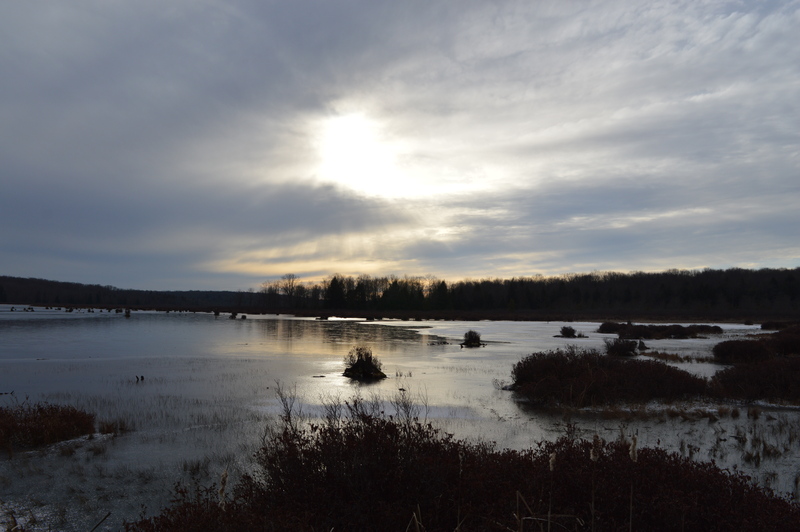 The 250-acre Black Moshannon Lake is fed by clear springs and small streams which flow through the bogs. As the clear water flows through sphagnum moss and other wetland plants, plant tannins color the water. Special thanks the Pennsylvania Department of Conservation and Natural Resources Bureau of State Parks for much of the information provided in this article.